Will you go for a stellar cruller or grab a glorious glazed? Time to take the donuts! A tray of tempting treats awaits your bid in this freshly baked card game. Will you go for a stellar cruller or grab a glorious glazed? A double chocolate is sure to score, but in the long run Boston cream may be worth more! Choose carefully - if two or more players go for the same donut, nobody gets it! End with the highest score and victory will taste sweet! 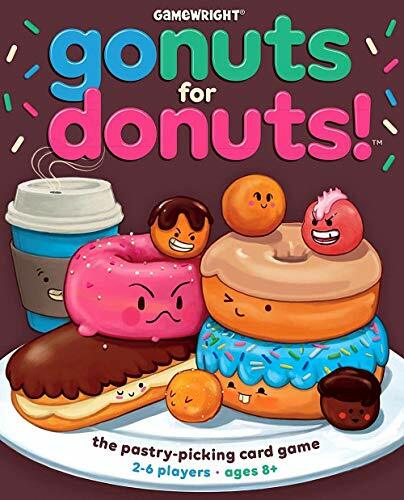 Go Nuts for Donuts is a fast-paced card game for the whole family with just a sprinkle of strategy. Outsmart your opponents and collect donuts hot out of the oven for points. But beware, if two players go after the same donut, then no one gets it! 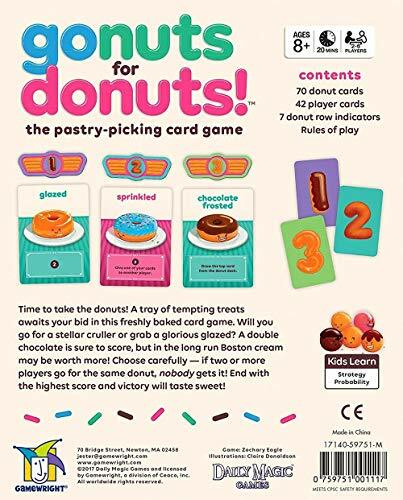 In Go Nuts for Donuts, players lay out donuts from the deck equal to the amount of players plus one. Each player has a number card for each donut that is out. Players all pick a donut they want by placing one of their number cards face down on the table. Players simultaneously reveal their number. If two or more players have matching numbers, that donut is discarded and no one gets it. If you're the only player that bid for the donut, than you take it and place it face up in front of you. Collect sets, unique and powerful donuts, and pairs of donuts to maximize points. 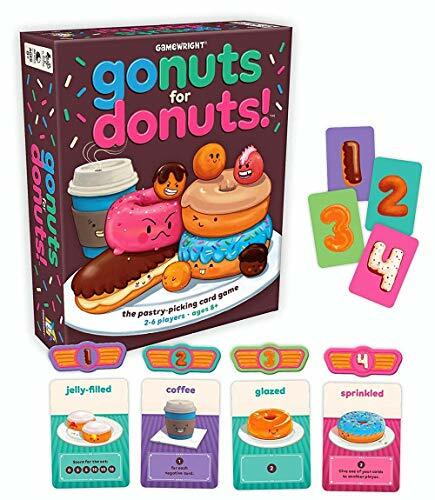 Go Nuts for Donuts helps to reinforce probability, visual declination and strategic thinking skills. Suitable for 2 6 players aged 8 and up with a playing time of around 20 minutes.